Villa Podere Monti. Found on a hillside among forests and olive groves in the splendid Tuscan countryside, Villa Podere Monti is only 800 m from Sant Albino di Montepulciano in the heart of Southern Tuscany. It is in an excellent position for visiting central Italy as many important towns are not far away - Perugia, Assisi, Siena, Cortona, Orvieto, Arezzo and San Gimignano are only an hour away by car. Montepulciano is only five minutes away (by car) and the highway is only 15 minutes away. Even Florence and Rome can be easily reached by car or train. This is also an ideal location for tasting the famous regional wines and delectable Tuscan food. 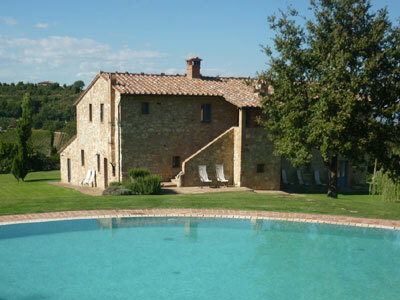 The Villa offers magnificent views of the vineyards and olive groves of Montepulciano. The historic farmhouse has been beautifully restored by the owners, who have furnished it with traditional antiques and every possible comfort. Found on a hillside among forests and olive groves in the splendid Tuscan countryside, the Villa is only 800 m from Sant Albino di Montepulciano in the heart of Southern Tuscany. This is an ideal location for tasting the famous regional wines and delectable Tuscan food. It is also an excellent position for visiting central Italy as many important towns are not far away - Perugia, Assisi, Siena, Cortona, Orvieto, Arezzo and San Gimignano are only an hour away by car. Montepulciano is only five minutes away (by car) and the highway is only 15 minutes away. Even Florence and Rome can be easily reached by car or train. S. Albino, 800 m away. High Season: 19/Apr - 26/Apr; 31/May - 28/Jun. Mid Season: 03/May - 31/May; 30/Aug - 27/Sep; 27/Dec/2014 - 03/Jan/2015. Low season: 04/Jan - 19/Apr; 26/Apr - 03/May; 27/Sep - 28/Dec.